Ghanbari Pakdehi, S. (2016). Adsorptive Removal of Al, Zn, Fe, Cr and Pb from Hydrogen Peroxide Solution by IR-120 Cation Exchange Resin. Iranian Journal of Chemistry and Chemical Engineering (IJCCE), 35(1), 75-84. Shahram Ghanbari Pakdehi. "Adsorptive Removal of Al, Zn, Fe, Cr and Pb from Hydrogen Peroxide Solution by IR-120 Cation Exchange Resin". Iranian Journal of Chemistry and Chemical Engineering (IJCCE), 35, 1, 2016, 75-84. Ghanbari Pakdehi, S. (2016). 'Adsorptive Removal of Al, Zn, Fe, Cr and Pb from Hydrogen Peroxide Solution by IR-120 Cation Exchange Resin', Iranian Journal of Chemistry and Chemical Engineering (IJCCE), 35(1), pp. 75-84. Ghanbari Pakdehi, S. Adsorptive Removal of Al, Zn, Fe, Cr and Pb from Hydrogen Peroxide Solution by IR-120 Cation Exchange Resin. 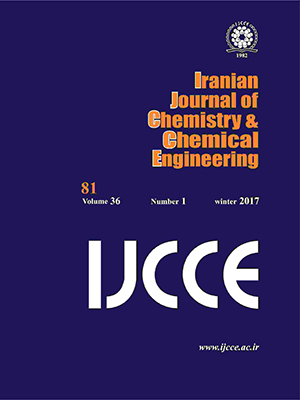 Iranian Journal of Chemistry and Chemical Engineering (IJCCE), 2016; 35(1): 75-84. Adsorption of cations Al, Zn, Fe, Cr and Pb from aqueous solution of hydrogen peroxide using IR-120 cation-exchange resin was studied. The removal percentage of the cations was examined by varying experimental conditions (such as pH of the hydrogen peroxide solution, temperature, contact time and dosage of adsorbent) in a stirred-batch system. Under the optimal conditions (pH=1, T=25oC, contact time=150 min, adsorbent dosage=5g), it was found that more than 98% removal was achieved. The cations adsorption was studied on the basis of Langmuir, Freundlich and linear isotherms in the concentration range of 0-50 mg/L. Adsorption of the cations on the resin followed first-order, pseudo-first-order (Lagergren) and intraparticle diffusion kinetic models in the cations range of 10-20 mg/L. The best fitted model for kinetic model was obtained as Lagergren model. The obtained studies showed that IR-120 cation-exchange resin was successfully used as an efficient adsorbent for removal of the cations from aqueous solution of hydrogen peroxide. Campos-Martin J.M., Blanco-Brieva G., Fierro J.L.G.,Hydrogen Peroxide Synthesis: an Outlook Beyond the Anthraquinone Process, Angew. Chem. Int. Ed., 45 (42): 6962-6984 (2006). Kirk-Othmer, "Encyclopedia of Chemical Technology", 5th ed., Wiley, New York (2004). Luan G.Y., Gao W.P., Yao P.J., Progress on the Preparation of Ultra-Pure Hydrogen Peroxide, J. Ind. Eng. Chem., 13(7): 1047-1053 (2007). Arab-zavar M.H., Kazemipour M., The Preconcentration and Determination of Pb2+, Cu2+, Co2+, Ni2+, Fe2+ and Zn2+ Elements in Water Samples Using Citrate form of Anion Exchange Resin, Iran. J. Chem. Chem. Eng. (IJCCE), 14(1): 10-15 (1995). Shah A.B., Shah A.V., Shah P.M., Selective Sorption of Heavy Metal Ions from Aqueous Solutions Using m-Cresol Based Chelating Resin and Its Analytical Applications, Iran. J. Chem. Chem. Eng. (IJCCE), 29(2):49-58 (2010). Pakdehi S.G., Alipour M., Adsorption of Cr(III) and Mg(II) from Hydrogen Peroxide Aqueous Solution by Amberlite IR-120 Synthetic Resin, Iran. J. Chem. Chem. Eng. (IJCCE), 32(2): 49-55 (2013). Chunhua X., Caiping Y., Adsorption Behavior of Cu(II) in Aqueous Solutions by SQD-85 Resin, Iran. J. Chem. Chem. Eng. (IJCCE), 32(2): 57-66 (2013). Demirbas A., Pehlivan E., Gode F., Altun T., Arslan G., Adsorption of Cu(II), Zn(II), Ni(II), Pb(II), Cd(II) from Aqueous Solution on Amberlite IR-120 Synthetic Resin, J. Colloid Interface Sci., 282 (1): 20-25 (2005). Taty-Costodes V.C., Fauduet H., Porte C., Removal of Cd(II) and Pb(II) Ions from Aqueous Solutions by Adsorption onto Sawdust of Pinus Sylvester’s, J. Hazard. Mater., 105(1): 121-142 (2003). Hu X., Wang J., Liu Y., Li X., Zeng G., Bao Z., Zeng X., Chen A., Long F., Adsorption of Chromium (VI) by Ethylenediamine-Modified Cross-Linked Magnetic Chitosan Resin: Isotherms, Kinetics and Thermodynamics, J. Hazard. Mater., 185(1): 306-314 (2011). Periyasamy K., Namasivayam C., Removal of Nickel Plating Industry Wastewater Using An Agriculture Waste: Peanut Hulls, Waste Manage., 15(1): 63-68 (1995). Xiong C., Meng Y., Yao C., Characters of Kinetic and Equilibrium of Adsorption of Eu(III) by An Cation Exchange Resin, Iran. J. Chem. Chem. Eng. (IJCCE), 30(1):97-105 (2011). Faghihian H., Rasekh M., Removal of Chromate from Aqueous Solution by A Novel Clinoptilolite-Polyanillin Composite, Iran. J. Chem. Chem. Eng. (IJCCE), 33(1): 45-51 (2014). Shakeri A., Hazeri N., Valizadeh J., Hashemi E., Motavalizadeh Kakhky A.R., Removal of Lead (II) from Aqueous Solution Using Cocopeat: An Investigation on the Isotherm and Kinetic, Iran. J. Chem. Chem. Eng. (IJCCE), 31(3):45-50 (2012). Weber Jr. W.J., Morris, C.J., in "Proc. Int. Conf. on Water Pollution Symposium", Vol. 2, 231-266, Pergamon Press, Oxford (1962).